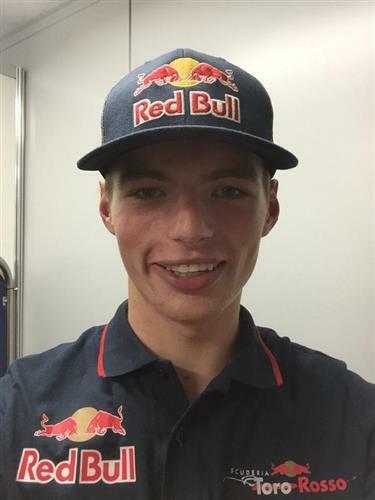 But the big interest in FP1 was Max Verstappen, the 17-year-old Dutch wunderkind who will be racing full-time next season. He finished just a few tenths off Daniil Kvyat before a late engine session - all in all a very impressive debut for the youngster. We'll be seeing him in the car again before this season is out, too, with further FP1 sessions scheduled. There is an even bigger issue lingering - quite literally lingering - over this weekend's race though. Typhoon Phanfone is currently on route to Japan and, though it should miss the circuit, there is horrible weather predicted at Suzuka this Sunday. A change in grand prix time is on the cards. Watch this space. One potential solution could be changing Saturday morning's FP3 to qualifying, with the race occupying where the race would have been. Another reason for concern, and for a potential schedule change, is that all of these teams have a quick turnaround before next weekend's Russian Grand Prix. If the race happens on Saturday, what time would it be at? @RohanMehta: If that were the case, it would be Saturday afternoon - the same time qualifying would have been. @RohanMehta: I'm not saying that's when it would be moved to, but it's one suggestion. Earlier on Sunday morning is a potential one but that's even worse for western European audiences, so I highly doubt that. First of all Hi Nate ! I always look forward to the practice session discussions with you ! 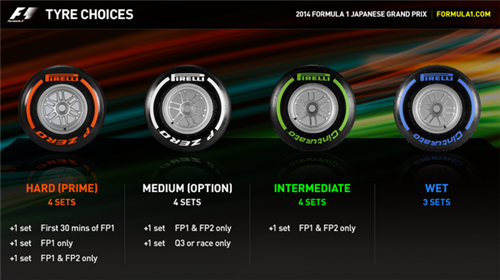 So according to you how will Ferrari, Williams, SFI, McLaren and Toro Rosso fit in this race ? @Atharva: Thanks! Well, Friday morning was interesting from Williams' point of view as Bottas was in the top part of the timesheets - a rarity in FP1. I think Williams is confident it can be competitive. Red Bull will likely be in the mix for the second row as well, while we just won't know about Ferrari until later in the weekend I'd say. 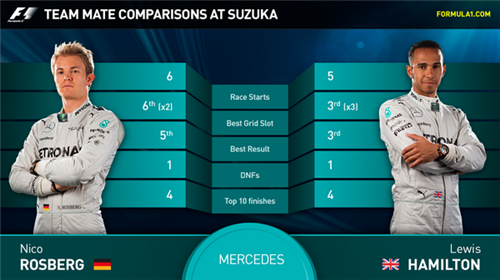 Helpful graphic there from F1.com and shows how both men are really yet to conquer Suzuka in their careers. Kamui Kobayashi is back in the car for FP2 after having Roberto Merhi in his Caterham this morning. Hi Nate, Just a quick verification on the double points for Abu dhabi, Is it only for the winner and the remaining podium 2nd and 3rd and how about the constructors been awarded..
@NalakaG: Any point scored by anyone is doubled, meaning everything from 1st to 10th is double points. And of course, the constructors' championship is an accumulation of points of teams' drivers - so it will have a baring on that. Bianchi the first man to head down the pit lane and completes a practice start at the end of the pit lane. My apologies, it was Chilton who went out on track first. He's been joined by Grosjean. Typhoons aside, the weather remains dry and warm today. The current remperature is 26 degrees Celsius, whilst track temperature is 44. Rumblings Alonso may have incurred a ten-place penalty for an engine change too.... We are on the case and will try and find out what the real story is. @knightofAMG: Haha, got to make it a fair poll! Grosjean sets the initial benchmark, a 1:38.440. The track getting a little busier with eight cars on track. Ten place grid penalty too? Who is the other one with that penalty this weekend? @RohanMehta: Mr Maldonado has picked one up for using his sixth Internal Combustion Engine. Kobayashi goes second, four tenths off Grosjean's benchmark. And Kobayashi is off at the Esses! Disaster for the local hero after missing the morning's session. His car looks like it's picked up a fair amount of damage. That was the last thing Kobayashi needed today. So is it confirmed that ALO has got 10 place penalty? @RohanMehta: No not yet. As I say, we are on the case and trying to find out if its true. Replay show the rear just stepped out on Kobayashi completely as he came into Turn 3. Very strange. Oh deal Kamui Kobayashi crashes out. Smashed the car up in the process. Wonder if the team have enough parts left to rebuild it. Bailiffs or not.. that won't help Caterham financially. Yellows out at the start of the Esses. 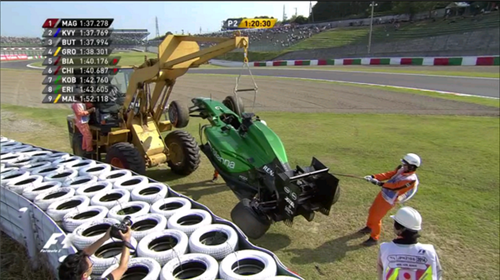 The crane is removing Kobayashi's car - his session is not over if... and it's a big if.... Caterham can get it out again. c'mon krashi!!! something mate..so much cash not much dash.Harsh? Kobayashi says "very strange" as he returns to the Caterham garage. All things considered, he looks in pretty good spirits. His mechanic says: "The speed was right but the corner too tight!" I like that saying.